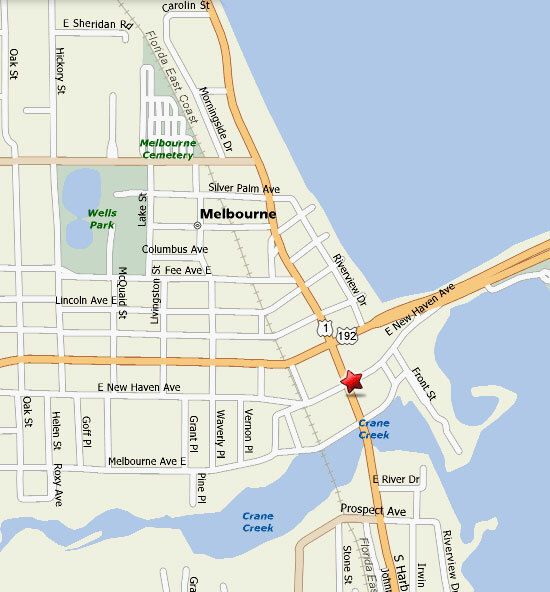 Melbourne Harbor Condos is located near the intersection of US1 and State Road 192 (New Haven Avenue), in the heart of Melbourne, FL (32901 zip code). Detailed directions: From I-95, take the SR 192/New Haven Avenue exit, and drive east about 5 miles until you come to the large intersection on US1. Turn right at that intersection, and go a short block south to the next traffic light. Turn left at the light, and then make an immediate right turn, after the gas station, into the Melbourne Harbor Condos driveway. Our condo building is set back from US1 and New Haven Avenue, and only the sign and the driveway is visible from the street. Melbourne Harbor Condominium is only a few miles from Melbourne Airport. Orlando International Airport is located approximately an hour away from Melbourne. The most economical way to get to the area, if you are not planning to rent a car, would be to use the shuttle services offered from the Airport. The cost for a trip from Orlando to Melbourne is approximately $35-$60. Alternatively, you could hire a taxi from the airport; however, a one way trip from Orlando to Melbourne would cost in excess of $100. Rate from Orlando Airport to the area is $58 for first person and $10 each additional person in the party. Orlando Sanford Airport - Offers some direct charter flights from places in the U.S., and the UK and Europe. Amtrak goes to Orlando from destinations across the U.S.